Where conventional filter cloths have reached their limits, MINIMESH® RPD HIFLO-S opens up new dimensions for filtration. Using new weaving technology developed by Haver & Boecker, a three-dimensional pore geometry is created that offers filtration properties that have not yet been attainable with all previous woven metal filter media. These properties set new standards and make industrial filtration processes quicker, safer and more efficient. As is the case for all MINIMESH® S metal filter cloths the pore size of MINIMESH® RPD HIFLO-S metal filter cloth can be calculated precisely in advance and adapted to the respective requirements. These precision pores can achieve extremely high cut-points and dimensional stability. The independent and internationally renowned institute Whitehouse Scientific has tested and confirmed these properties. Previous filter cloths with small pore sizes lead to reduced flow rates and significant pressure loss in the production process. Due to the new three-dimensional cloth structure the open surface over an area is significantly increased. For a given pore size, the flow rate is more than doubled compared to conventional woven metal filter media. In addition, the flow conditions are optimized and turbulence around the filter cloth is effectively avoided. Flow compared to a conventional MINIMESH® DTW-S (left) and a RPD HIFLO-S (right), both with 15 µm pore size. Due to the three-dimensional cloth structure the number of pores and thus the open surface over the same area is increased. 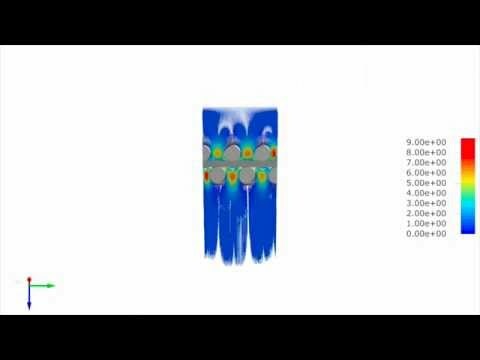 The flow behavior of RPD HIFLO-S is optimized. By comparison: conventional woven wire filter cloths can cause turbulence that affects the filtration process at high flow rates. Purging properties of a RPD HIFLO 15-S compared to a conventional DTW 14-S.
With MINIMESH® RPD HIFLO-S, corrosion- and temperature-resistant filter cloth with pore sizes smaller than 40 µm are available for the first time. 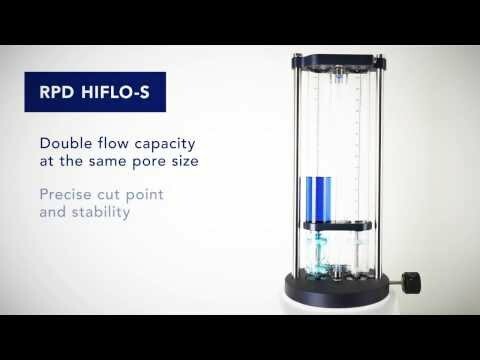 he innovative weaving technology of MINIMESH® RPD HIFLO-S allows to calibrate the pore size within one batch from 5 µm to 40 µm as desired. The production volumes can thus be perfectly matched to the specific requirements.